An answer came during the Congressional Black Caucus’ annual legislative conference this past week: Everything. 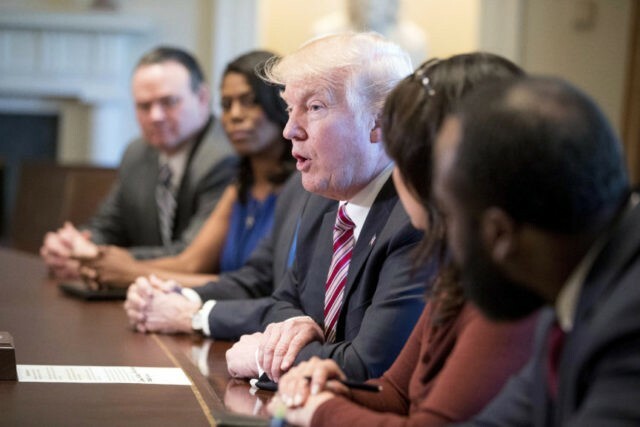 Those who flocked to the nation’s capital for the gathering of black lawmakers, leaders and policy experts identified multiple ways that black Americans are losing ground under President Trump’s watch. The conference, which ended Sunday, took place against the backdrop of yet another attempt by the GOP-controlled Congress to undo a signature domestic achievement of the country’s first black president, the Affordable Care Act. Over the past eight months, black Americans have also been alarmed by the administration’s attempt to undo federal housing programs, a lack of funding for historically black colleges, and a retreat from discussion of disparities in policing of minority communities. The conference also happened as Trump attacked NFL players who kneel in protest during the national anthem. Since last season, several players have knelt or raise fists when the anthem is played to protest police treatment of blacks and social injustice. This year’s CBC conference was the first since President Barack Obama left office, shifting the national black political leadership mantle from the White House back to Capitol Hill. The heavily Democratic caucus — currently boasting its largest-ever membership with 49 representatives and senators — so far has had a testy relationship with Trump, who got only 8 percent of the black vote when he was elected last November. Trump met with CBC leadership in March. But in June, the caucus turned down an invitation to meet again, saying their concerns have fallen on “deaf ears” at the White House, and that Trump’s policies are harmful to black Americans. Trump’s claim that “many sides” were responsible for racial violence in Charlottesville, Virginia, in August, and that there were “very fine people” among the white nationalists in attendance protesting the possible removal of a statue of Confederate general Robert E. Lee, generated controversy. Trump has rejected the persistent condemnation of his words and actions on matters involving race. Speaking from the White House amid overwhelming criticism of his statements, he declared, “Racism is evil,” and said he condemned white supremacists and other hate groups. He declared himself to be “the least racist person that you have ever met” in a December 2015 interview with CNN. At a raucous town hall meeting on Thursday, Reps. John Lewis of Georgia and Maxine Waters of California urged attendees to push back against Trump’s agenda and the newly emboldened neo-Nazis and white supremacists who have wholeheartedly embraced it. “He’s a throwback,” Waters said. She noted Sessions’ reversal of ex-Attorney General Eric Holder’s stance on mandatory minimums for crack-cocaine prison sentences, which have disproportionately affected African-Americans, and his review of federal consent decrees for local law enforcement agencies. During the campaign, many black voters were put off by Trump’s references to blacks “living in hell” and his promises to restore “law and order” to cities like Philadelphia, Chicago and Baltimore. This summer, Trump suggested that police officers be more rough with suspects when taking them into custody. Philadelphia city councilman Derrick Green said Trump’s budget proposals are harmful to cities because they eliminate programs like the community development block grant. “It is really questionable how he can really say that he wants to help cities like Philadelphia,” said Green, noting that Philadelphia remains the poorest big city in America, with a poverty rate double that of the national average at more than 25 percent. Economist Julianne Malveaux, who attended the conference, called Trump’s characterization of urban centers “stereotypical and stupid.” Malveaux, former president of the all-black women’s Bennett College in North Carolina, cited Trump’s lack of support for historically black colleges in the budget, as among the examples of his lack of urgency to address concerns in the black community. Whack is a member of The Associated Press’ Race and Ethnicity Team. Follow her work at www.twitter.com/emarvelous .